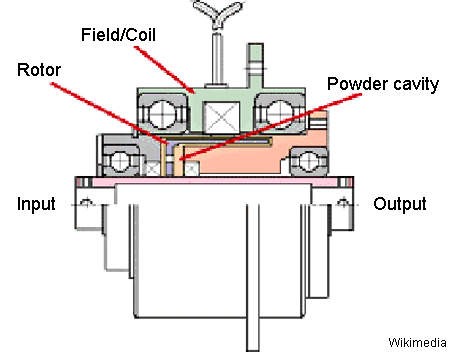 A magnetic particle clutch is the type of electromagnetic clutch which doesn’t have the friction plate. Torque transmits mechanically through powder fillings. Magnetic particle clutch consists of two rotating discs. One of them is attached to the driver, and the other is attached driven shaft. The free space between these rotors is filled with the magnetic particles. Magnetic particles are usually suspended in oil; sometimes fine graphite powder is used instead of oil. Before energizing the clutch, the magnetic particle lies in random and do not couple mechanically. The clutch has a field coil. It generates a magnetic field when current passes through it. The magnetic field aligns the particle in the form of a chain. The hardened the powder creates a link between two discs and facilitates torque transmission. The strength of link can change by varying the current. 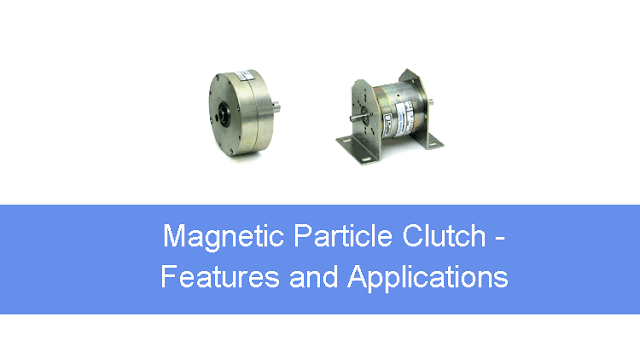 Here is some advantage of magnetic particle clutch. Easy to install and versatile mounting. Torque is consistent with low and high speed. The torque is independent of slip. Instantaneous response of magnetic particle. Extremely high precision can achieve. Free from “stick-slip” (jerking motion during two objects is sliding over each other). Because of accuracy in torque control, they are suited for tension control application such as wire winding. They are used in high cycle application such as labeling sorting machines due to its fast response. Anyone have any design equations/theory for mag particle clutch design?